Simon Rogers at the Guardian gives a summary of how data journalism has developed at the Guardian Newspaper. Have seen him do this talk before, but it seems to be evolving as they develop new tools. Adam Thomas works for the innovative software company called Sourcefabric. I've done some work for them in the past when they were at an early stage of developing their radio playout and newsroom systems. Adam recently gave a talk at a hackathon in Austria about his collaboration with West Africa Democracy Radio, a team of 12 journalists based out of Dakar, Senegal. WADR cover a huge editorial area in West Africa, 3 times the size of Western Europe. Being lean, they take a different approach to making news, with less legacy and larger scope than the incumbents. By focusing on audio, WADR has found a large following in the Senegalese diasapora. They went to 500,000 downloads a week. They have 76,000 followers on Soundcloud, beating some of the European competitors targeting the same audience. I'm curious why so many followers are in Japan. Adam also talks about the Yemen Times and how they rescued their archives. They discovered that by making the material more user friendly that the usage of the site went up dramatically. They made a move into radio as well. They use design to provide a competitive edge. I'm struck by the similarity of the Sourcefabric approach to the Lean Startup Methodology. They do customer development before they even think about designing code. This was the fundamental flaw with international broadcasting 10 years ago. They did audience research AFTER making the programme, rather than when it was in the conceptual phase. 1.Think Data. How will you visualise data? How will you import and export data easily so you can adapt to changing technology? 2. How will people experience your material? What is the next iPad? How can you seamlessly move to emerging platforms. 3. Define and understand your users. In the early days, Airtime was too complicated for some of the community stations, not sophisticated enough for professional users such as the BBC. Listen to your users! 4. News organisations don't break news. Platforms break news. News is never finished. Data, graphics and code are playing an increasingly important role. 5. Design for scale. The architecture of the Soundcloud servers was the secret of their success. 6. Avoid costly recoding because designs haven't been tested. Learn from the challenges LinkedIn faced in 2011. Create once, publish everywhere is crucial. 7. Localise early and often. Set up a framework to do this from the start. Build a community strategy around this. 8. Less features, more speed. Get to the minimum viable product. 9. Understand how to react to failure. 10. Make the most of your strengths. WADR focuses on audio, and covers only West African developments. The Netherlands has a new king. Although there have been some nice words said during the official investiture in Amsterdam this morning, I am struck by what HRH Willem-Alexander said about the importance of technology and knowledge for the future of this part of Europe. He was opening TheNextWeb on Thursday last week. There is obvious interest in watching the moment on-line. 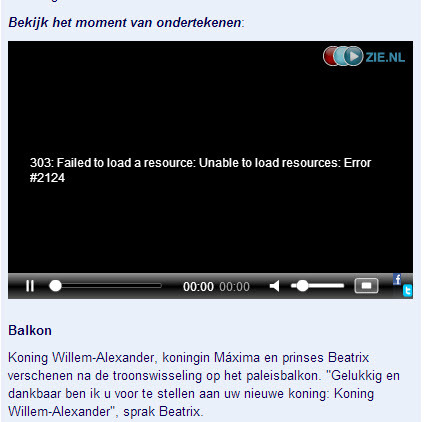 Servers from Zie.nl obviously can't take the pressure at least on the feed to nu.nl. The new song about King Willem-Alexander as adapted for use in Germany. Dutchy Welle? May be not. Local broadcasters, the lifeblood of many Brazilian communities, face tough times. Rafael Spuldar reports on the Index on Censorship website in London. Community radio stations are one of Brazil’s most widespread ways to democratise information and develop citizenship within the poorer urban areas and the countryside. However, many people from the community media environment feel the law does not allow these broadcasters to function at full capacity. Community radio broadcasting was effectively regulated in Brazil in 1998 through a bill that laid out criteria and rules. Stations are required to operate in low-powered frequency modulation (FM) up to 25W. The stations’ programming must also be open to all inhabitants in its coverage area, should not aim for a profit and have no connection to political parties or religious institutions. Brazil currently has around 4,700 community radio stations, operating either with full or temporary authorisation from the federal government. Up to another 1,300 stations that are waiting for authorisation to begin broadcasting. Experts and stations representatives say that community stations are still a great way to empower people through efficient communication within their communities, even in a time when social media and cyberspace seem to command the most attention. “While commercial media speaks about a place, community media speaks from a place”, says Professor Adair Rocha from PUC-Rio and Uerj universities. Rocha has more than 30 years of experience working with community communication in Rio de Janeiro. In this context, the phenomenon of social media has strengthened community radios, giving them space to publish programming notes and attract new listeners, says José Luiz Sóter, executive coordinator at Abraço Nacional, which is Brazil’s Community Radio Broadcasting Association. States from the South and Southeast regions, the richest in Brazil, have the highest concentration of community radio stations in the country, especially in the metropolitan areas. The federal government has been criticised for not doing more to improve the legislation that regulates community radios, which is generally thought to be obsolete. One of the radio stations’ main complaints is related to diversifying the sources of financing. The 1998 bill states that stations can only get advertising in the form of “cultural support”, stipulating it only comes from sponsors located inside its community – which is seen as something that limits the radios’ financial viability. Associations like Abraço Nacional also demand more broadcasting power for stations and a streamlined authorisations process for new stations. Brazil’s Ministry of Communications denies the existence of any obstacle in the authorisation process. In 2011, it created the National Plan of Grants for Community Radio Broadcasting, which publishes a list of expansion locations months ahead, allowing time for interested parties to collect required documentation and to prepare themselves to go on air. “Many times, however, the entities that ask for the authorisation do not send us the complete documentation, which pushes back the schedule”, says the Ministry’s general coordinator for Community Radio Broadcasting, Samir Nobre. Nobre says the government intends to make it possible for all municipalities in Brazil to have at least one community radio by the end of 2013. Around 2,000 of the 5,500 cities in the country still don’t have community radio stations. Abraço Nacional recently issued a statement criticising the government for not completing a series of recommendations that it had committed to complete by November 2011. One of the demands was making communities radios eligible for the federal government’s advertising budget, which has not yet been done. “The public power has done everything to make it difficult for community radios to survive”, says Abraço Nacional’s José Luiz Sóter. The Ministry of Communications responded by saying that community radios are an “important form of communication” but claimed it has no power to modify the law in force. The community radio movement has also been hijacked by many groups — political and religious — flouting the law to create broadcasting outlets . Radio stations that were supposed to have community-driven programming end up being vehicles for the interests of private groups. The Ministry of Communications acknowledges the problem and says it is doing its best to improve control over authorised stations’ operations. On the other hand, some community radio stations that violate the law’s technical restrictions or that simply start operating without authorisation are considered by the government to be “pirate radios”. Many of them end up being shut down and having their equipment impounded by the police. Traditional media often portrays these “pirate stations” as a menacing problem that could interfere with the frequency used by flight controllers, allegedly threatening the safety of commercial flights. Some see this kind of attitude as a move by big media companies to stop community stations from operating. TechShop San Francisco is located at 926 Howard Street, just one block from the Moscone Center, three blocks from the Powell Street BART station and six blocks from Union Square. The 17,000-square-foot facility has a private parking lot. This community based workshop and prototyping studio is on a mission to democratize access to the tools of innovation, TechShop is packed with cutting-edge tools, equipment, and computers loaded with design software featuring the Autodesk Design Suite. Most importantly, TechShop offers space to make, and the support and camaraderie of a community of makers. The rise of the global Fablab concept from Jonathan Marks on Vimeo. Brent is back with his own channel on YouTube. Brent? The Office? 10 years ago? Anyone? Nearly a million people seem to remember Ricky Gervais playing this part. Signs that you don't need a TV programme to get an audience. In 2010, my son Christopher, dipped into my archives and those from an open BBC project. He also did some of his own interviews and compiled a video documentary as part of his final exams at the University of Amsterdam. It actually turned into a rather nice overview of what we were all thinking social media would develop into. For the most part, the principles outlined here haven't changed that much. It's just that some of the software that was hyped then has now been built. I think this is worth a second look. This is an update on a post from July 2011. I've added the video from TNW 2013. I am in an intensive research mode at the moment, while it is pouring with rain outside in the Netherlands. I am learning such a lot from Gabe Zichermann who is a born marketeer, gamification specialist but also engaging speaker and storyteller. He runs the Gamification Summit and Workshops. But I still think his best presentation so far has been in Denmark to a group of people who are busy re-branding the country after the cartoon fiasco a few years back. This talk really sums up the challenges for marketeers who want to understand what game designers do to engage their audience, pulling them in instead of shutting them out. Gamification - The New Loyalty from Gamification Co on Vimeo. I see a lot of what he is talking about having a direct application to the broadcasting business which is struggling to engage with the public (often because the journalists and producers don't really want to). So I am working on workshops to bring the two world's together, cherry-picking from the best of both worlds. The challenge is not to discover the new ideas. It's to get rid of the old routines and integrate new thinking. Had a chat with Siebrand Dijkstra myself at TNW. I find the feature that he mentions at the end of the interview (3'44) to be their secret sauce. Their crawler looks at the target website for videos, RSS feeds, twitter etc and puts that automatically into the app. Now that is clever. The app-machine guys are actually in the Frisian Silicon Valley, up in the North of the Netherlands. Creative bunch. Deserves to succeed. Stephen Wolfram gave a fascinating talk at TheNextWeb conference in Amsterdam at the end of last week. The interview above focuses on a near miss deal with Google. But I don't think the interviewer actually uses Wolfram Alpha search engine. I do, after a reference to it in iPad Today on the TWIT.TV network. They make various specialized search engines which I find extremely useful for making comparisons. Just play with it for the fields that you and understand and watch this engine come up with relevant charts and figures. There has been a lot of talk about data journalism - and how it might help to save investigative journalism. There have been plenty of conferences about it, like this one in Amsterdam a while back. What is there to learn? - Data-Driven Journalism 2010, Amsterdam from European Journalism Centre on Vimeo. But my conclusion then was that the tools were far from being ready to be integrated into a newsroom workflow. Some organisations, like New York Times and the Guardian have taken data journalism seriously. But if you look at the investment even these organisations have made, it is just a handful of people on the workfloor doing this. I believe it is because a lot of data manipulation is still cut and paste and fiddle rather than drag and drop. The software is not yet easy to manipulate so non-techincal writers can see the mean. And data analysts are generally not very good at putting the data into the right context. It may be a brilliant discovery, but if its a line in an Excel sheet the outside world will never know. But things are looking up, even if progress is slow. This week in Perugia, in Central Italy, there was the annual conference for journalists. It is not as sweet as the annual chocolate festival held in the same place, but from my point of view far more interesting. This year's conference was particularly relevant as journalism in many countries is going through exceedingly tough times - catastrophic collapse in some cases. As business models are difficult to justify, managers tend to concentrate on quantity of stories rather than quality.And yet the audience, I believe, is searching for quality. The fluff is free. The considered analysis is never free. I do wish there was an executive summary of the discussions that went on in Perugia over the past few days. I don't need an event report - I'm far more interested in short interviews to understand the current issues and what is being done about it. It turns out the videos of the sessions are actually quite interesting, but they desperately need topping and tailing. You can quite happily skip the first few minutes of most of the videos on the YouTube channel. Lucy Chambers from the Open Knowledge Foundation explains about the schoolofdata.org which has launched on-line courses to help people understand what is possible. They have developed "data expeditions" putting developers, analysts, and designers together during hackathons. Aron Pilhofer who is the Interactive news editor at the New York Times looks at how data journalism exposed speeding by law enforcement agencies in the US. It was Pulitzer Prize winning material. The cops were caught when the Sun Sentinel got hold of toll booth records A three-month Sun Sentinel investigation found almost 800 cops from a dozen agencies driving 90 to 130 mph on US highways. Many weren’t even on duty - they were commuting to and from work in their take-home patrol cars. The extent of the problem uncovered by the newspaper shocked South Florida’s police brass. The evidence came from police SunPass toll records. The Sun Sentinel obtained a year’s worth through a freedom of information request, hit the highways with a GPS device and figured out how fast the cops were driving based on the distance and time it took to go from one toll plaza to the next. Speeding cops can kill. Since 2004, Florida officers exceeding the speed limit have caused at least 320 crashes and 19 deaths. Only one officer went to jail — for 60 days. Aron explains that he runs a data journalism team at the NYT of 18 developer journalists. The social media team is 7 people. And the latest team is the newsroom analytics team to understand how the newspaper can be more effective and impactful as journalists. This is still small compared to the 1100 people in total who work at the NYT. Dan Sinker director Knight-Mozilla Open News explained that Firefox is soon to launch its own OS as well. Interesting to hear about the differences between freedom of data in the US compared to Spain. Mar Cabra explains in the first part of this next video the challenges she faced. Skip the first five minutes of this next video to understand more about using Excel spreadsheets to discover storiees. Interesting tutorial for beginners. Some of the most successful collaborative investigation platforms and projects in Europe and Asia - from the Organised Crime and Corruption Reporting Project, to FarmSubsidy.org, Help Me Investigate and OpenSpending. The panelists in the next video focus on how can the different cultures of investigative journalism and hacking be brought together. What techniques and knowledge can developers bring to investigative journalism? Paul Wood from BBC News starts talking in English at 14'53" explaining that the Syrian civil war has been played out almost entirely on YouTube. He has filed several reports as World Affairs Reporter for BBC News. He recalls being in Ar Rastan in Syria where he was taken to the front line where a gun battle started. He suspects that it was partly because the foreign journalists had shown up. He recalls seeing a guy firing a heavy machine gun through a hole in a breeze block wall. 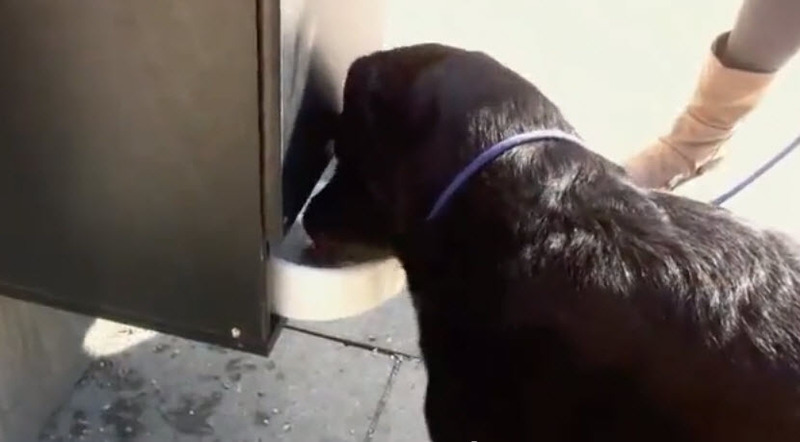 And there were two colleagues by his side filming this on their mobile phones. In war journalism, there is what you see yourself and what others tell you. And the only part you know is true is what you see yourself. He tells the story of meeting several citizen journalists who are spokesmen for the Free Syrian Army and are armed themselves. And the Syrian journalists on both sides of this horrific conflict are each fighting for recognition of their side of the story. And some citizen journalists like Jeddy end up being hated by both sides. He also recalls being stuck outside Houla and realising that Skype interviews were coming out of the city which were more detailed they could do from their vantage point.Towards the end of the session, (1 hr 14 minutes) Paul says he is quite pessimistic - and many of the rebels are now disillusioned that their efforts with Western journalists have not led to any form of intervention. Ruth Sherlock of The Daily Telegraph explains the dilemma in trying to find people who will speak to you. She built a database of 1000 contacts in Syria. She also explains how backers of various factions want to see YouTube videos showing how their money has been spent. Hence a proliferation of YouTube Videos. Bryan 29'10 says he doesn't like the way local journalists are just seen as fixers for foreign journalists when in fact many have risked their lives to get stories out. How can we create the trust between locals and the foreigners? I remember watching a slightly different version of this talk at LIFT in Geneva many moons ago. But Jan's point about how mobile phones have changed banking, especially in Africa, still hold true today. In fact, countries like Kenya are way ahead of European countries, partly because we have ATM's everywhere. No so in rural Africa. So airtime becomes a currency. Switch now to Amsterdam and Startupbootcamp, where I'm an in-house mentor to several startups, They've announced a Contactless accelerator program and have launched a search for startups working in the area of contactless payments in health, transport and retail.We got an update from Dirk Jan de Haan who is managing a team looking at how NFC and related technologies can be used in their railway stations. The Netherlands has made the NFC card compulsory on their public transport system. I still don't understand why the system is restricted to paying for a train ticket. I have walked away from so many grab and go convenience stores in the station because I know that the lines are too long and I will miss my train. And there are still quirks in the system in that supplements, such as for the FYRA express between Amsterdam and Rotterdam can't be paid with the NS train subscription - only with a bank card. Clearly, a lot has to happen before the simplicity of a card swipe makes life a lot easier. The highlight of the event in Amsterdam was a great presentation by Lejo Duivenvoorde, who is Strategy Director for the Omnicom Media Group in Amstelveen. I've known him for many years as a very creative advertiser who knew that the secret is in understanding the audience. He explained successful interactive projects they did with Sony (to introduce the James Bond film Skyfall into the Netherlands), interactive store windows in Germany, Pepsi and McDonalds. 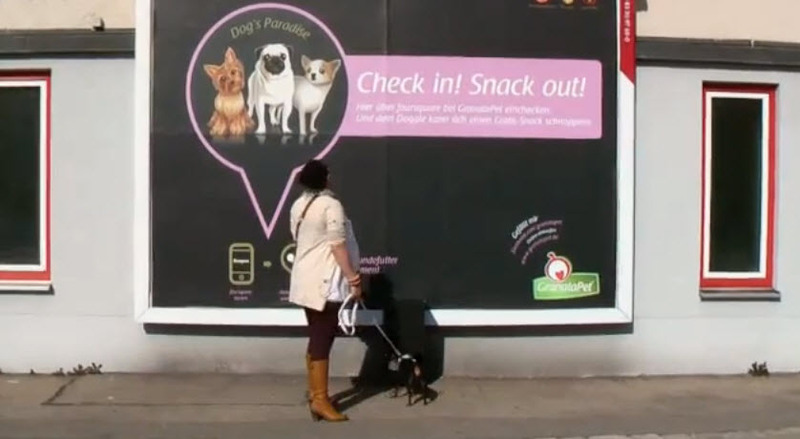 He also showed the GranataPet food case study from 2011. They built a dog food dispenser which was targeted when the owner checked in on Foursquare. Clever. Though I have yet to see the idea repeated. Finally, I like the video of the oyster card check ins on London transport. Would love to see similar map with the check ins using NFC across the Netherlands. Nielsen Falters - When will they awake from their slumber. Excellent article in Wired by Tom vanderBilt about why the ratings information from research organisations like Nielsen are less and less valuable in a multiscreen world. Although, just being liked on Facebook, or followed on Twitter is still a crude measurement, it sure beats electronic diaries. Nielsen has been incredibly slow to adapt to changing audience behaviour. I note that Tweetbot has added multimedia filters, an obvious way of competing with GetGlue. All of your favorite shows are ratings dogs.Breaking Bad, Girls, Mad Men. Each struggled to top a score of 2.5, rarely cracks Nielsen’s top 25. There are two possible conclusions to draw from these facts: (1) All these shows should be canceled, or (2) maybe the ratings are measuring the wrong thing. Since the 1970s, television has been ruled by the Nielsen Family—25,000 households whose TV habits collectively provide a statistical snapshot of a nation’s viewing behaviour. Over the years, the Nielsen rating has been tweaked, but it still serves one fundamental purpose: to gauge how many people are watching a given show on a conventional television set. But that’s not how we watch any more. Hulu, Netflix, Apple TV, Amazon Prime, Roku, iTunes, smartphone, tablet—none of these platforms or devices are reflected in the Nielsen rating. (In February Nielsen announced that this fall it would finally begin including Internet streaming to TV sets in its ratings. In the years after its founding in Chicago in 1923, the A.C. Nielsen Company thrived, thanks to a commitment to math and technology. While its competitors called random households and asked them what they happened to be listening to on the radio at that moment, Nielsen developed more sophisticated sampling methods. Rather than rely solely on self-reporting, Nielsen employed a device called the Audimeter that used photographic tape to automatically record listening activity. When television arrived, Nielsen used similar meters for viewing—although they were supplemented with paper diaries. But by the late 1950s, Nielsen sat comfortably atop the media-ratings industry. It had few competitors, and since television habits remained static, it had little reason to keep innovating. But the widespread adoption of the DVR in the mid-2000s roused Nielsen from its torpor. In 2007 the company hammered out its “C3″ rating, a metric that includes the number of people who watched a show—and therefore the commercials—up to three days after its original airing. (The company also came up with a C7 tabulation, tracking audiences for a full week.) Networks loved the number—it seemed a truer representation of their shows’ actual audience. But at first advertisers didn’t pay much attention. Viewers who recorded a show on a DVR were assumed to be fast-forwarding through the commercials and thus immune to sales pitches. Labels: nielsen, vanderbilt, wired. audience research. So what does a Distributed Denial of Service look like? So how do you visualize what's going on in the Internet? This is one way. Logstalgia is a website traffic visualization tool that replays or streams web-server access logs as a pong-like battle between the web server and an never ending torrent of requests. Requests appear as coloured balls (the same color as the host) which travel across the screen to arrive at the requested location. Successful requests are hit by the paddle while unsuccessful ones (e.g. 404 - File Not Found) are missed and pass through. The Mashable website reported that VideoLAN developer Ludovic Fauvet turned a recent DDoS attack on their server into a Logstalgia video that shows an amazing, one-sided fight between thousands of requests, with the web server desperately trying to keep them all at bay. We've all heard of DDoS (distributed denial of service) attacks bringing down web servers, but most people can't really imagine what a DDoS attack looks like. During a DDoS attack: many computers (sometimes an entire botnet) send a lot of requests to a single web server, rendering it very slow or even completely unavailable. Happens to international broadcasters all the time. Originally from Canberra, Australia, Tiffany Hart and her team are currently on a world tour to develop and grow their startup business. 7write.com is a fresh approach to an old problem. It’s a publishing platform designed to empower authors, publishers and the reading public. So what’s different about Tiffany’s thinking? The 7 write team recently arrived in the Netherlands, a country with a strong literary tradition. Tiffany points to a study by TNS-NIPO researchers a few years back. 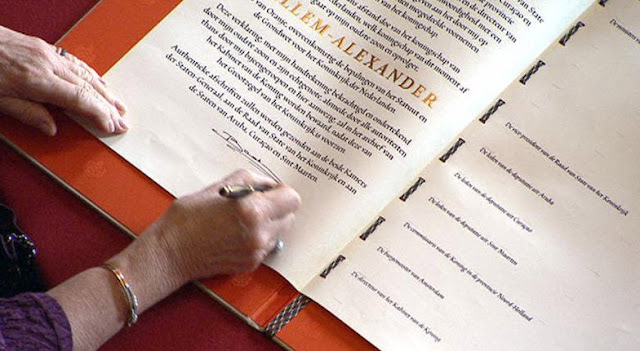 It revealed that around 1 million of the 17 million Dutch are actively writing something. One in six hopes to get published. Yet only 93,000 will actually submit their work to a professional publisher this year. 7write is building an online platform to help authors simplify the publishing journey. They’re integrating a suite of useful authoring tools to make publishing a book to the 14 different e-platforms a few clicks work. “We’re in closed beta at the moment. We’ve invited selected authors to try and test our technology. We’re 48 hours away from launching our open beta. And we’re working with publishers, broadcasters and enthusiastic readers to improve the business for everyone. We’re passionate about getting this right. 7write created their first partnership with a Dutch publisher, Bertram + de Leeuw this week. We’re encouraging those interested in what we’re creating to sign-up for advanced details of our public beta. And we’re looking forward to memorable conversations with those who love telling stories”. This is one of the recent profiles I've done on the founders of European startup companies that I am building for Startupbootcamp. Aliveshoes is an Italian startup currently in the Dutch capital, having been chosen for the Amsterdam Startupbootcamp Accelerator program 2013. Luca Botticelli CEO of Aliveshoes.com explained to me that he’s been dreaming of when he can turn his passion into a business. It is now. “So that’s why we’re building Aliveshoes. It’s actually more than a store. It’s an on-line partnership between the public, leading-Italian designers and shoe craftsmen back in Italy. Together we can take a great idea and make it happen”. “Secondly, I’m from a shoe-making family in Italy. I know that we have a rich tradition of craftsmanship which needs to adapt the changing values of a modern market. I want to create a business which will have a social benefit within the Italian Shoe Valley district. We need to combine our craftsmanship with modern technology so that these fine traditions will thrive and grow. Everyone understands a lot about shoes. Because we all need them! Aliveshoes is currently based in Amsterdam, participating in Europe’s leading accelerator program Startupbootcamp. Luca Botticelli can be reached at luca@aliveshoes.com. Love this parody. But it also has a grain of truth. Going to be using Twitter a lot less once Tweetdeck goes away. What are these guys trying to do? Squeeze the platform until it bursts? Important broadcast material documenting the 20th century, which has cost millions of Euros to make, is rotting in vaults. Worse still, as the economic crisis in Europe worsens, valuable collections are being destroyed. This is complete madness when, in other parts of the world, archivists like Brewster Kahle have come up with practical solutions. Of course, not everything can be preserved. But dumping the lot is destroying heritage which cannot be replaced. The archivists on the West Coast of the US have a path to preserving heritage for next generations. And I love people who not only have big ideas, but also execute on them. Leo Laporte interviewed Brewster this past week. It's a great interview because Brewster has refined his story of why this is all so important. And he is now getting the backing of many libraries who realise that the old models are breaking down. Libraries provide access to knowledge in coherent ways. And although we often think that "everything is on the Internet", that is just not true. The US Library of Congress has a collection of 26 million pieces. The Internet Archive is collecting about 1 billion items a week. They have around 10 Petabytes (10 thousand Terabytes) which they store inside a former church. I see the BBC's been to the archive too. There is a clip from Alan Yentob on YouTube. Few people know that the Internet Archive has also been taping US TV channels off the air since 2009 and coming up with a great search engine to find quotes (like they do on the Daily Show). Recently had the privilege of talking with Brewster on his visit to Amsterdam to talk with info.nl. Call to action - Help and advice needed. I have compiled and curated an archive of the Media Network programmes I made between 1980-2000. 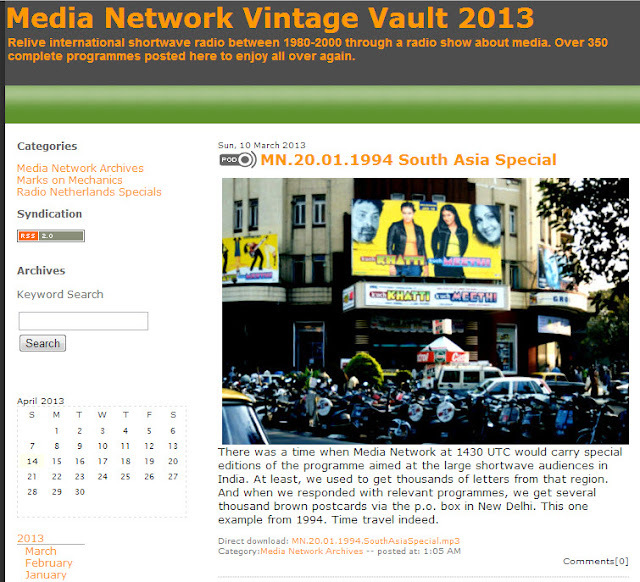 It is about 200 hours of audio material documenting the (inernational) broadcast media for the last half of the 20th century. We did quite a few documentaries on broadcasting before, during and after the Second World War. I am wondering how to transfer this on-line collection to the Internet Archive, together with the metadata that goes with it. I notice that that in general, people on the production side of things are awful at writing useful metadata so that others can find their great productions. That's why I rewrote the summaries. Without that material, it doesn't make sense. I don't get the 10 million downloads a month that the Internet Archive can boast, but having 5000 unique downloads a month of material which is 20 years old still shows it has some value. By all means explore. You can get in touch through www.jonathanmarks.com or About me. Update: interesting stats from this article in the Guardian today. Kahle, a computer scientist who made a fortune in the 1990s with tech ventures, including Alexa Internet, dreamed of a Great Library of Alexandria 2.0 since he studied at MIT. The archive's first headquarters was in the nearby Presidio district. In 2009 it moved into a former Christian Science church on Funston Avenue; its pillars and facade evoke antiquity. About 50 staff work here and another 100 work elsewhere in the bay area and in 32 scanning centres, usually in libraries, around the world. The centres digitise books, microfilm and regular film. Automation proved imprecise so it is done manually, each worker processing 800 to 1000 pages per hour. This labour means material such as Boston's John Adams Library, the Hoover archive and the 1930 US census are now online and free. Institutions such as government agencies, libraries and universities, many outside the US, pay modest fees for special requests. 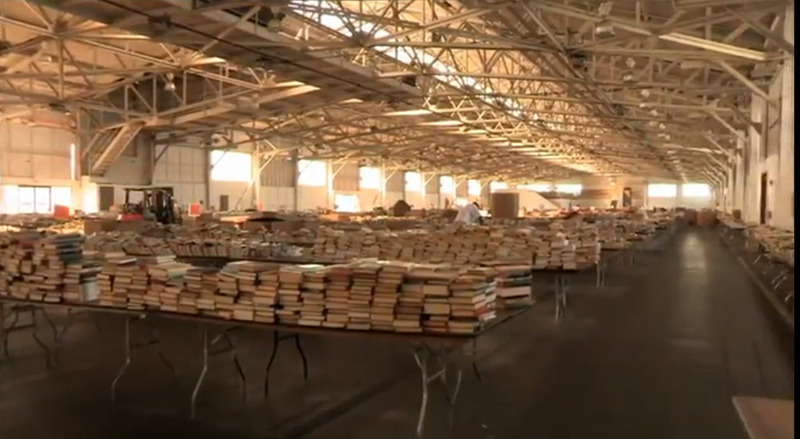 The archive has also stored 750,000 actual books at a nearby climate-controlled storage unit, a literary equivalent of the Svalbard global seed vault. There is space for another 780,000. Engineers "crawl" the world's top million websites, capturing and storing pages which link to other pages which are captured and stored. Every three months they start over, because the list of top million sites constantly changes. An average web page lasts 75 days. In 2009, they raced against the clock to save as much as they could of the web-hosting service GeoCities, before Yahoo shut it down. If the owner of a defunct website prefers that the pages remain dead, he or she can ask the archive to remove them, requests that are almost always granted. May be I should qualify that. We're all trying on the same pair that tech writer Robert Scoble brought with him to TheNextWeb conference in the Western part of Amsterdam today. Fair play, Scoble stuck around for around 2 hours after a stage interview with Andrew Keen to let people try them on, pose for photos and ask questions. He could have escaped like other speakers...but he didn't. Photo quality wasn't bad at all. Only challenge is that that position above the right eye is not the most interesting angle for photos. and remember this college project called Sight from last August? I'm very curious to see what price these glasses will eventually sell for. I can't imagine it has cost Google more than US$150 to make them. They have obviously spent time and money on the design. My guess is under US$300. Assuming they ever ship to the general public. John C. Dvorak, one half of the no-agenda show, believes Google Glasses is nothing more than a hoax and a giant publicity stunt. I'm pretty sure that others are working on wearable competitors. Like Go-Pro, for instance. But, for the moment, Google is generating a lot of media exposure for a remarkably little piece of investment, especially at a time when Apple is stuck in its product cycle....not producing anything really new. I even tried them on. Though ironically couldn't take a picture of myself wearing them! 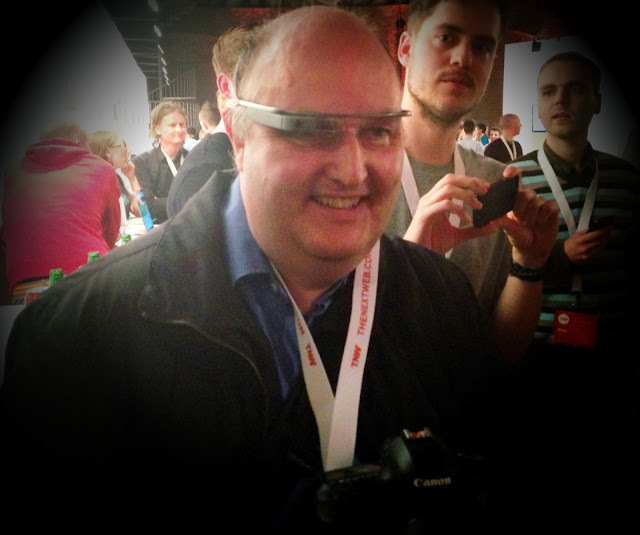 Jonathan Marks gets his one minute with Google Glasses. Fascinating. Surprised at the quality of the video definition. Is there hope for hyperlocal news? De Correspondent - crowdfunded to the bank.